"As you are now, we once were; as we are now, you shall be." 1:00 p.m. to 1:30 p.m.
Join us to explore a 17th- century crypt and meet the mummified monks interred within. The rosy pink facade of Brno's Capuchin Church belies the haunting contents of its underbelly: the mummified bodies of dozens of monks, laid solemnly to rest within the crypt. 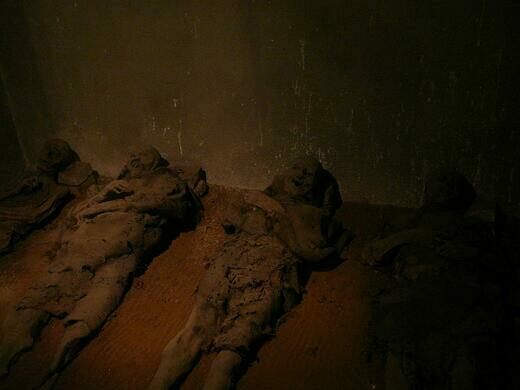 Mummification was never the intention. In keeping with their vow of poverty, the monks thriftily re-used a single coffin time and time again. 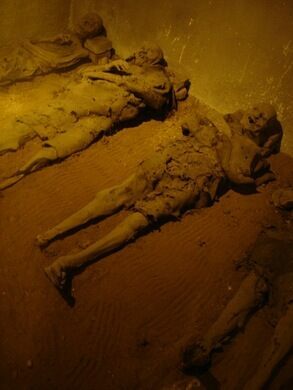 After the funerary rites, they would move the deceased into the crypt, and lay him to rest on a pillow of bricks. The dry air currents and composition of the topsoil gradually preserved the bodies where they lay. The result is remarkable. 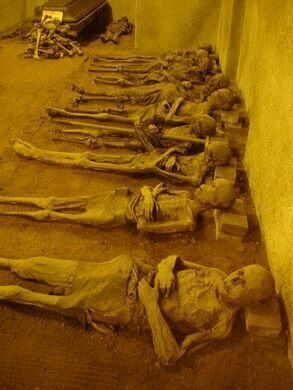 Twenty-four monks lie perfectly preserved, arranged in rows across the floor. All are clad in robes and a number are draped with rosaries or still found clutching a crucifix. 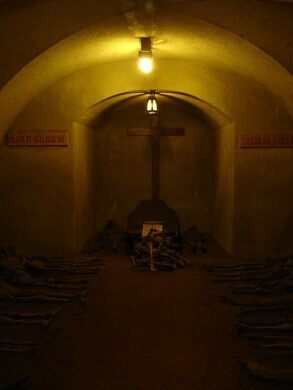 This Obscura Day we'll be navigating the church's subterranean passageways to view the main vault of the crypt. Join us for an opportunity to explore the history of the Capuchin Church and delve into the evolution of burial practices leading up to the end of the 18th century, all while confronting 300 years of the Brno Capuchin brotherhood in a state of eternal rest. Share photos on Twitter and Instagram with us @atlasobscura using the #obscuraday hashtag.